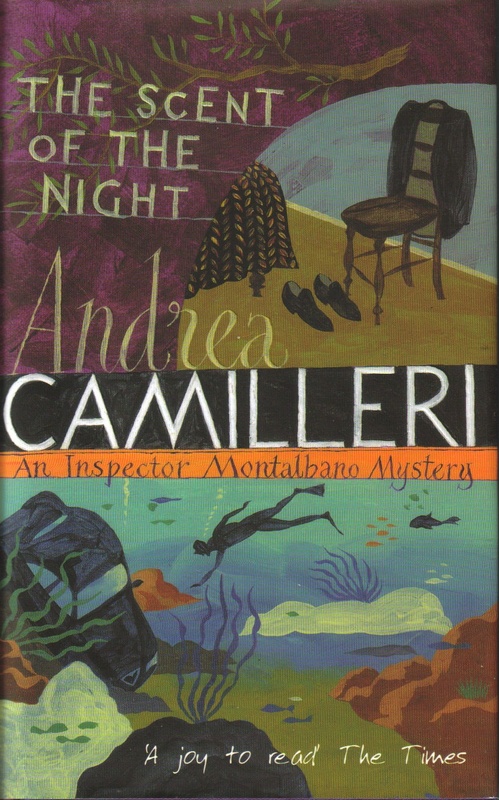 I have finished reading The Scent of the Night and do not have another Camilleri on my bookshelf to read. If I had not just eaten a delicious meal of haddock baked in a parcel, with capers and courgette, I would be feeling even more distraught. I read this book very quickly because firstly it is another excellent crime novel and secondly because the main family TV is away for repair. I realise how much valuable reading time I waste watching crime shows, news programs, and political discussions. Sometimes it is difficult to tell which program is which, but for the fact that the fictional criminals look more honest than the real life politicians. Camilleri’s successful formula is repeated once again with charm, humour and wit. Mimi Augello philanders even while waiting to marry, Catarella rushes around mangling his words, Fazio works hard like a classy guy and Commissioner Bonnetti-Alderighi loses his cool with Montalbano. And “liccu cannarutu” Salvo Montalbano investigates, while carrying on with some difficulty his long range, and long term relationship with Livia. When octogenarian Salvatore Garzullo realises he has, like many of Vigata’s naive citizens, been swindled out of his savings by ragionere Emanuele Gargano, he takes action and holds the financial adviser’s secretary hostage. Mariastella Cosentino the fiftyish homely secretary does not believe Gargano has perpetrated a simple fraud and thinks he has had an accident. When Montalbano and his trusty team are told to take a secondary role, and defer to the fraud expert Inspector Guarnotta we know it will merely encourage them to pursue a “private” investigation. The other members of Gargano’s office are the beautiful young Michela, and a young assistant Giacomo Pellegrino. When Montalbano discovers that Pellegrino has also disappeared, and Michela informs him about the relationships in the office he begins to form a theory. Guarnotta meanwhile has decided the Mafia are involved, but Montalbano is not convinced as mafiosi are surely too shrewd to fall for a financial scam. With Mimi Augello seducing Michela, and Montalbano’s favourite Saracen Tree cut down to make way for a house the investigation meanders along until Salvo Montalbano surprisingly finds himself living in a short story by William Faulkner. pasta ‘ncasciata: one of the many forms of southern Italian pasta al forno, that is, a casserole of oven baked pasta and other ingredients. Pasta ‘ncasciata generally contains small macaroni, tuma or caciocavallo cheese, ground beef, mortadella or salami, hard boiled eggs, tomatoes, aubergine, grated Pecorino cheese, basil, olive oil and a splash of white wine. William Faulkner born New Albany, Mississippi in 1897, he wrote among other works As I Lay Dying, and The Wild Palms. He was awarded the Nobel Prize for Literature in 1950. >I’ve enjoyed reading your reviews of his books, Norm/Uriah, and I’d like to read him when I get a bit of a clearer space (will that ever happen?). I never watch TV but I don’t seem to have much time for reading…where does it all go? (Time that is). I have read Faulkner, though, a long time ago. I enjoyed those books, though I think I was a bit young to fully understand them. >I’ve just started Scent of the Night. He does make me chuckle!! >Thanks , Maxine.I must admit that I have not missed watching TV, and there is the advantage that I missed some dreadful performances by our cricket team. My son studied Faulkner and Cormac McCarthy for his English A level which I thought rather adventurous. When we drove briefly through Faulkner’s northern Mississippi it was a bit tame no weird characters or burning crosses , just a lot of people mowing their lawns.I think you would really like reading Camilleri especially as you enjoyed Gianrico Carofiglio.